The Fastbraces® Technology patented bracket design uses unique, triangular shaped braces that allow for the use of just one super-elastic nickel-titanium wire during the treatment process. This brace technology works on an entirely different mechanical principle altogether. Historically, old braces would move the crown of the tooth in the first year, and the root of the tooth in the second year. Fastbraces® Technology helps move the crown and root of the teeth at the same time, from the beginning of the treatment. Patients can now get results often with less sensitivity, in about a year, and in some instances, just 3 months. 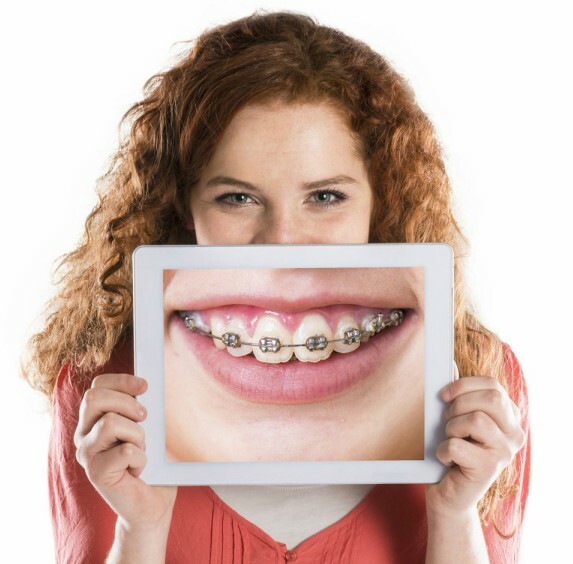 The biggest question for a child who may need braces would probably be “how quickly can I get them off?” While there are no miracle shortcuts in orthodontics, Fastbraces® Technology is different by design which allows for typically treatment time of one year instead of two. Some patients even see results in as little as 3 months!The old braces are usually square in shape and typically move the crown of the tooth in the first year, and the root of the tooth in the second year, thus requiring two years of treatment time. The patented triangular bracket in the Fastbraces® Technology gently allows for movement of the crown and the root of the teeth at the same time with no extra risk for the patient. University Research has shown that Fastbraces® Technology had “lower sensitivity”, “a clear-cut reduction in sliding friction” and “the lowest mean frictional forces” compared to the old braces systems. through university research. Fastbraces® Technology typically works with just one orthodontic wire from start to finish, whereas old braces usually require a series of wires and tightening procedures. Fastbraces® Technology uses a special square super-elastic nickel-titanium wire which is activated by the heat of the mouth. This dynamic wire helps upright the whole tooth using the natural temperature of the mouth in just one stage, safely and comfortably. With safety in mind, Fastbraces® Technology was developed to straighten teeth differently – allowing for a fast, safe and affordable solution.Fastbraces® Technology allows for movement of the roots of the teeth towards their final positions from the beginning of treatment by torquing them from the very first appointment. Patients can now get results often with less sensitivity, in about a year, and in some cases, just a few months. It has been developed and tested over the past 20 years and is now becoming available in countries around the world . Fastbraces® Technology is fast, safe, easy and affordable treatment. With the patented triangular design of the braces, cutting edge techniques and a special heat-activated wire, this new technology is revolutionizing the field of orthodontics.Traditional braces move teeth into position in two stages, usually over a period of about two years. In the first year, the crown of the tooth is moved into alignment. In the second year, treatment addresses the position of the root of the tooth. However, the brackets used with Fastbraces® work on a different mechanical principle altogether. The patented system uses an innovative bracket and a specially- shaped wire to correct the position of the root of the tooth, from the beginning of treatment. This combination is key in realigning the root and crown simultaneously. The Fastbraces® Technology brackets have an elevated slot and a unique elbow design. The shape of the bracket is critical because it literally changes the force-flexibility equation. The square shape of conventional brackets defines the distance between the brackets and that distance determines the flexibility of the wire. However, the triangular shape of the Fastbraces® patented bracket, with its elevated slot, typically increases the distance between the individual brackets, which increases the flexibility of the wire. Additionally, the “elbows” of the bracket help deliver torquing and tipping forces to the root from the beginning of treatment. These fundamental differences allow treatment to be completed in about a year, or as little as 3 months in select cases. For the consumer looking for an aesthetic cosmetic solution, Fastbraces®Clear™ ceramic brackets are also available and offer the same technology advantages of moving teeth as the Fastbraces® metal brackets.Twenty (20) years of history, thousands of consecutively treated patients and university research have shown that Fastbraces® are not only safe but offer many additional benefits. Patients oftentimes experience less discomfort and there are no more risks with Fastbraces® than those associated with traditional braces. Additionally, the fact that the braces are on for less time means that there is possibly less chance of tooth decay due to improper oral hygiene. Treatment with Fastbraces® Technology improves the patient’s lifestyle because treatment typically takes just a few visits at the doctor’s office. Less doctor visits mean less money spent, less gas used getting to and from the doctor’s office and less time off school or work. Another remarkable benefit is the reduction of retainer usage. When the braces come off one needs to wear the retainers only 15 minutes a day in the shower, cleverly described as Fastbraces® “Tooth Shampoo”. A: Fastbraces® were developed to straighten teeth differently. Fastbraces® is the revolutionary system of fast, safe, easy and affordable braces that is changing the field of orthodontics. It is a complete, non-extraction system for most cases, which provides patients with outstanding results. treatment addresses the position of the root of the tooth. However, the brackets used with Fastbraces® work on a different mechanical principle altogether. The patented system uses an innovative triangular bracket and a specially- shaped square wire to correct the position of the root of the tooth, from the beginning of treatment. This combination is key in realigning the root and crown simultaneously. Q: How long is the treatment time? A: Fastbraces® Technology gently allows for movement of the roots of the teeth towards their final position from the onset of treatment, achieving root parallelism at the beginning stages, thus completing treatment from 3 months to about a year. Some patients see results in just weeks! Q: Are Fastbraces® less Painful? A: University research has shown that Fastbraces® Technology has low mean frictional forces, a clear-cut reduction in sliding friction and pain reduction with fitting front and back teeth together. Q: Do I have to wear a Retainer? A: With the complete alignment of the roots of the teeth, retention is needed every day for only 15-20 minutes (“Tooth Shampoo”.) Some people like wearing the retainers at night (“Teeth pajamas”). No more retainers for hours during the day for months after treatment. This is yet another reason why Fastbraces® Technology is changing the way orthodontics is done altogether.